New Delhi: China and India – two economic powerhouses of Asia – are contributing significantly to the greening of the planet, a new global study released on 11th February has found. The world now has about 5.5 million square kilometers of extra green leaf area round the year compared to 2000. A bulk of this increase is due to greening in China and India. 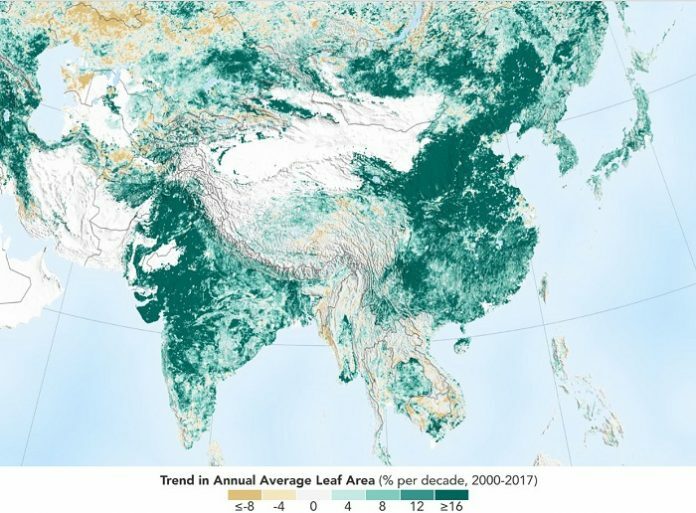 China has contributed 25 percent to this increase while India added 6.8 percent of the total global net increase in leaf area between 2000 and 2017. The contribution to the greening by the two countries is much higher though they have less vegetated area than some of the developed countries. China has 6.6% and India only 2.7% of global vegetated area. The increase in total leaf area recorded in India is equal to that in the United States or Canada, each of which has three times more vegetated area. Greening refers to increase in total leaf area – forests, croplands, orchards, monoculture plantations, commercial plantations. The increase in green areas is mostly due to 35 percent increase in food production in both the countries with multiple cropping aided by facilitated by fertilizer use and availability of surface as well as groundwater irrigation. China has also taken up on a large scale rejuvenation of forest areas and afforestation on degraded lands. In China, the greening is from forests (42%) and croplands (32%), but in India it is mostly from croplands (82%) with minor contribution from forests (4.4%). Earlier studies had identified carbon dioxide fertilization as the main reason for the greening of earth’s lands. But this study has found that greening is more due to land use changes. The study is based on satellite data from MODIS sensors of NASA. These sensors view the entire earth twice a day at 500 meter resolution. “China and India account for one-third of the greening but contain only 9% of the global vegetated land area. This is a surprising finding considering the general notion that there is land degradation in populous countries due to over-exploitation,” Chi Chen of the Department of Earth and Environment at Boston University, lead researcher, told India Science Wire. The study has been published in journal Nature Sustainability. However, experts feel that the increase in greening driven by croplands and plantations should not be seen as compensation for loss of forests in Brazil, Indonesia and other parts of the world. “Greening due to intensive agriculture does not enhance the land sink because crop carbon quickly returns back to the atmosphere,” explained Dr Victor Brovkin of Max Planck Institute for Meteorology, Germany, also a co-author of the study. “Since the contribution of forests in India’s greening is minor (4%) it has not been explored in detail in this study. However, it is important that we find overall greening trend in natural vegetation (forests) in India, unlike some recent studies reporting a browning trend,” commented Dr Rajiv Kumar Chaturvedi (BITS Pilani, Goa campus), and a member of the research team. When asked how the new study compares with the forest area statistics of the Forest Survey of India (FSI), Dr Chaturvedi said the two can’t be compared as both have different contexts and objectives. “I believe that FSI estimates are supposed to be more robust as their estimates are supposed to be based on thousands of ground observations, in addition to satellite data. However, FSI estimates will gain more credibility if their ground data as well as satellite assessment is made publicly accessible and is subjected to rigorous peer review,” he added. The research team included Chi Chen, Taejin Park, Baodong Xu and Ranga B. Myneni (Boston University); Xuhui Wang, Shilong Piao, Zaichun Zhu (Peking University); Rajiv K. Chaturvedi (BITS, Goa campus); Richard Fuchs (Institute of Meteorology and Climate Research, Germany); Victor Brovkin (Max Planck Institute for Meteorology, Germany); Philippe Ciais (Université Paris Saclay, France); Rasmus Fensholt (University of Copenhagen); Hans Tømmervik (Norwegian Institute for Nature Research); Govindasamy Bala (Indian Institute of Science, Bangalore); Ramakrishna R. Nemani (NASA Ames Research Center).